Start with the 1960s folk tradition of Peter, Paul & Mary; add the vocal complexity and electric energy of Crosby, Stills & Nash, a dash of the Byrds and a jot of Joni Mitchell, and you have a folk-rock/Americana harmony trio that has been turning heads for nearly a decade on the northeastern folk circuit and beyond. swept the international folk radio chart Folk DJ-List in March, 2016, as their new original CD Keepsake took the #1 album and #1 song slots which, with five other songs in the top 25, landed them as the #1 artist as well. This followed on the heels of When One Door Closes (#3 album, January 2014) and Red Apples and Gold (#5 album, September 2012). 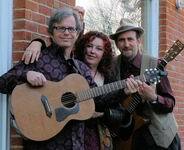 With a vocal blend oft-described as seamless, inspired guitar playing and precise percussion, Stuart, Hillary and Gerry evince deep roots in �s folk-rock, with a healthy dash of traditional folk in the mix. Their stage chemistry makes clear that they take the music (if not themselves) very seriously, yet their infectious energy wins over even fans who never considered themselves folkies. 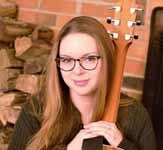 To date, has had a record five juried showcases at NERFA (Tricentrics in 2009 and �, a Formal in 2011, a mini-NERFA showcase in 2013 and a Quad in 2015); they were one of the three Emerging Artists at Falcon Ridge Folk Festival in 2012 voted 揗ost Wanted� to return in 2013. Whether a tribute show of �s classics or a concert of (mostly) originals, a night with will make evident why they were voted one of 揕ong Island抯 Best� by the Long Island Press. is a performing songwriter/singer who carries a torch for the 6/8 ballad. Eryn predominantly writes country songs for male or duet vocals, though she抣l follow a song wherever it wants to go, whether that is in Americana, folk, indie pop, or modern lullabies. Eryn is a current Nashville Songwriters� Association International Top 40 pick and she was previously American Songwriter Magazine's November/December 2017 Lyric Contest Winner for her song "Old Habits.� She has performed at the Bluebird Cafe in Nashville, TN and she is an alum of the Acoustic Guitar Project. She served in the Army as a Civil Affairs Sergeant in Iraq, and she currently resides in Gaithersburg, Maryland.